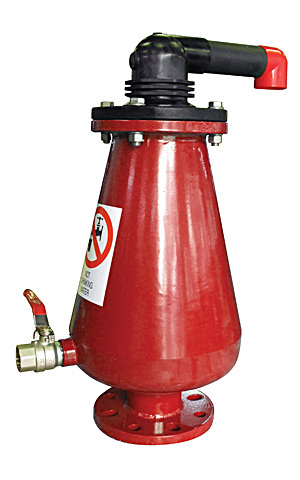 The D-020 Combination Air Valve combines an air & vacuum orifice and an air release orifice in a single body. The valve is specially designed to operate with liquids carrying solid particles such as wastewater and effluents. The combination air valve discharges air (gases) during the filling or charging of the system, admits air into the system while it is being emptied of liquid and releases accumulated air (gases) from the system while it is under pressure and operating. The valve’s unique design enables the separation of the liquid from the sealing mechanism and assures optimum working conditions. Available in flange sizes: 50mm – 200mm (2"- 8"). The 50mm valve is also available with a threaded BSP or NPT connection. 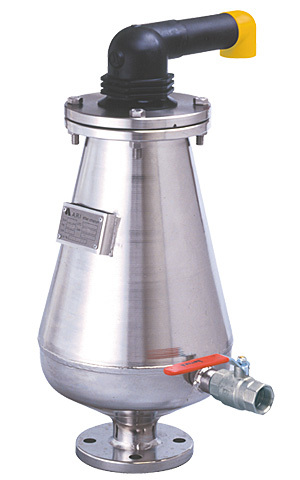 These valves are manufactured with flanged ends to meet any requested standard. Lower valve body made of Steel St. 37. Upper body, cover and internal parts made of corrosion- resistant composite materials and EPDM rubber. Internal metal parts made of corrosion-resistant stainless steel. Air valve also available in stainless steel. Additional one-way options for air intake/discharge only as well as an additional non-slam option.